Leading global economists gathered at the European University Institute in Florence on the 18 and 19 November to discuss the challenges of economic policy. 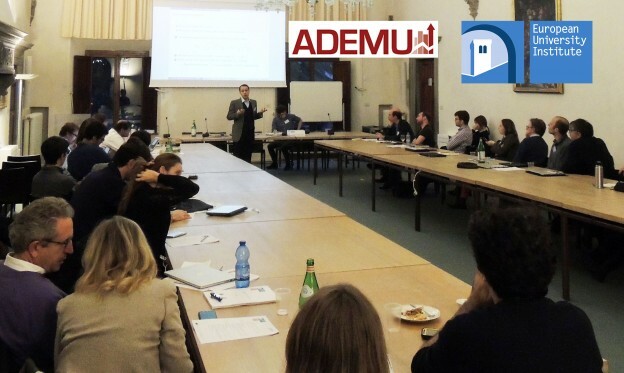 The workshop, co-organized by the European University Institute and ADEMU, saw 61 economists, researchers and academics examine fiscal policy and unemployment, capital flows and sovereign debt, as part of a research project designed to address issues within the European monetary union. ADEMU’s scientific co-ordinator Ramon Marimon chaired a discussion on ‘Capital Flows and Sovereign Debt’, with papers presented by Raul Santaeulàlia-Llopis (MOVE-UAB) and Timothy Uy (University of Cambridge). Other topics discussed included political economy, prices, and economies with adverse selection. Academics and researchers travelled to Florence from establishments including the University of Minnesota, Freie Universität Berlin, the University of Bologna and the University of Mannheim for the workshop. This entry was posted in Activities, Event reviews, News, Workshops on December 12, 2016 by ADEMU.